In the Niobrara and Laramie Cretaceous. Kansas Academy of Science, Transactions 23:70-74. 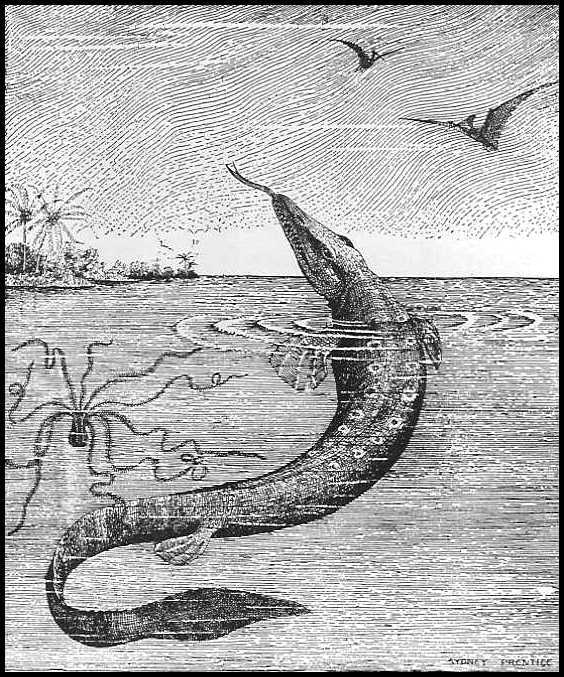 Wherein Charles Sternberg describes some of his fossil discoveries from the Smoky Hill Chalk of western Kansas, including a Platecarpus mosasaur, a Pteranodon, a large Ginsu shark (Cretoxyrhina). and another shark (Squalicorax) with teeth so small they could only be seen with a magnifying glass... See more about Charles H. Sternberg here. 70 Kansas Academy of Science. THE early part of the season was spent in the Kansas chalk. As has been the case during many of the last thirty-five years, since I first began collecting in this formation, I have been quite successful. My three sons, George, Charles and Levi, were with me, while the monotony of camp life was broken by the presence of my son George's wife and baby son. 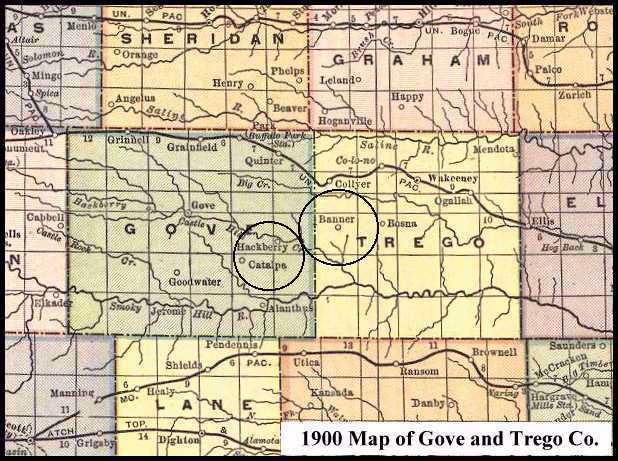 We made our first camp at Mrs. Livingston's ranch, on Hackberry creek, south of Quinter, Kan., in Gove county, near the eastern line. And we are under many obligations to Mrs. Livingston and her two sons for shelter for our team, as well as hay; otherwise our horses might have suffered from the inclemency of the weather . While here I experienced for the first time a very peculiar electric storm. About the 10th of May a violent wind and dust storm came up from the northeast about sundown, and gravel, sand and earth were hurled through the air with great force. I faced it for a hundred yards to get my son Levi, who was at the barn. My face was beaten with sand and gravel, and I could hardly walk, owing to the fury of the gale. However, I got to the barn, and, taking my son's hand, we started to return. It was so dark that we could not see an inch ahead. What was my surprise to see the telephone line that was suspended over my tent dotted with points from which light radiated in all directions, and as far as I could see the line it was swinging, with myriad little lamps, back and forth with the wind. Looking around, I saw posts that supported a barbed-wire fence sending out light in the same way, except of course, they were stationary. I found after the storm that these centers of light were nails driven in the posts. So for the first time in the history of western Kansas, as far as I have observed, we had a display of St. Elmo's fire. 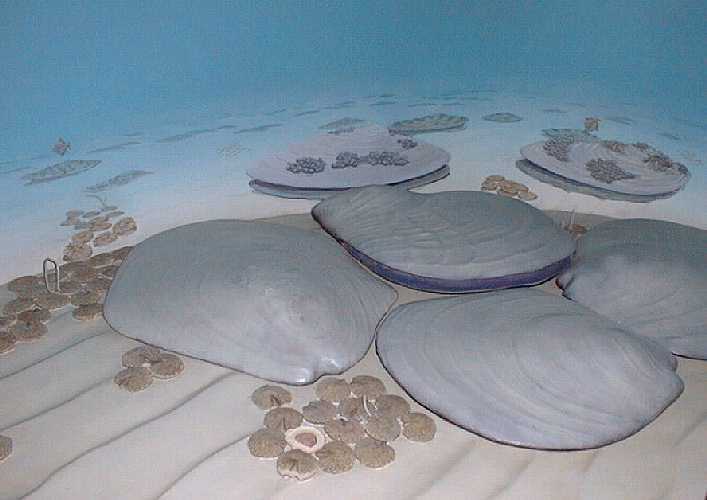 by Kansas winds, No wonder the late Prof. E. D. Cope saw in imagination these shells as the remains of a feast of Titans. This great cretaceous shell will be mounted in the American Museum, New York. We found in the same vicinity enough material of the mosasaur Platecarpus coryphæus to enable us, with the assistance of some exchanges we made with the University of Kansas, to make a complete slab mount of this swimming lizard, once so abundant along the shores of the old cretaceous ocean in western Kansas. The specimen is seventeen feet long, and is being mounted by my two sons, George and Charles, and myself, and is now nearly completed. Our second camp proved very rich. Here we camped southwest of Banner post office, in Trego county. 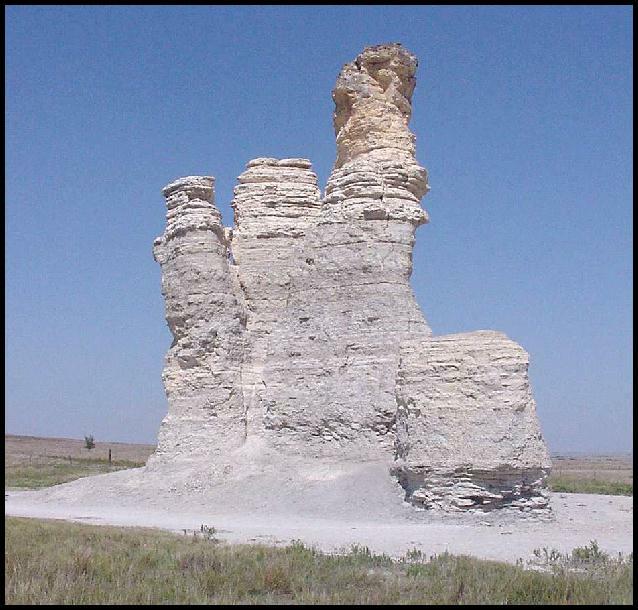 Some photographs I exhibit show some sculptured towers near Castle Rock, a few miles west of our camp. George discovered a fine skeleton of a great flying reptile Pteranodon. This also has gone to the American Museum. One wing was complete, including the claw-armed fingers used in clinging to rocks while at rest. Our bats hang head downward, while the Pteranodons hung with head up. The crowning discovery of our work here was the discovery by George Sternberg of a nearly complete skeleton of a great shark, Lamna. In 1891, while employed by the Munich Museum, I discovered the first and most complete skeleton known of the shark Oxyrhina mantelli in the same vicinity. This was made the subject of Dr. C. R. Eastman's inaugural address delivered before0 the Ludwig-Maximilian University of Munich for his Ph.D. degree. 72 Kansas Academy of Science. the same region today. Doctor Dean has restored a set of jaws measuring nine feet across and having a gape of six feet. In my specimen the largest tooth is an inch and a half long while the smallest is but three-eighths of an inch. According to these measurements, the ancient shark with teeth six inches long must have been 100 feet in length. That such measurements cannot be relied on is proved by my discovery of a large part of the shark Corax, from the Kansas chalk. The vertebræ proved to be as large as in Lamna and yet none of the teeth were over half an inch in length. Further, I have in my laboratory to-day a new species of shark, found this season on Hackberry creek whose vertebræ are half as large as the Lamna we secured. The teeth are so small that some of them can only be seen with a magnifying glass. It is pretty safe to restore one of these extinct sharks, because their skeletons are so rare that they will in all likelihood never be discovered. But I believe if these great teeth of the Carolinas are ever, as in my specimen, found in place, the beautiful restoration in the American Museum will go to the junk pile. disassociated bones by Marsh and Hatcher, and the other authorities who copied after them, were wrong; and instead of its being a land animal with thick skin. and leaping around like a kangaroo or frog, it is a water animal, and was web. footed, with a skin as thin as ours, covered with minute scales no larger than a snake's. So, as I have said so often before, the most carefully prepared restorations made by our highest scientific authorities fall to pieces when the complete skeleton is found of the animal in its normal position. A man cannot mount a skeleton right when he has every bone lying slightly disassociated before him unless he has seen the animal with bones in position first. The quicker scientists learn this truth the sooner will science teach the truth instead of so much error. 74 Kansas Academy of Science. eight inches in diameter. This hill is across the Cheyenne river from our camp, above the mouth of Greasewood creek. I also show you the skull of Triceratops as it lies, hewn out of the grey cross-bedded sandstone, ready to wrap with burlap, soaked in plaster, so we can take it up ready for shipment. The horn-cores are in sight, as well as the roof of the mouth, the eye socket under the horn, and the nasal opening, the beak that was covered with horn, etc. The frill had weathered out and lay in fragments, mingled with the debris at the foot of the cliff. I might, in closing, mention the very fine tail we found of Trachodon, the duck-billed dinosaur, as well as a second, containing the entire trunk region. This, with the loose bones we collected, will enable the British Museum to make a very fine mount of this great dinosaur, some thirty feet in length. 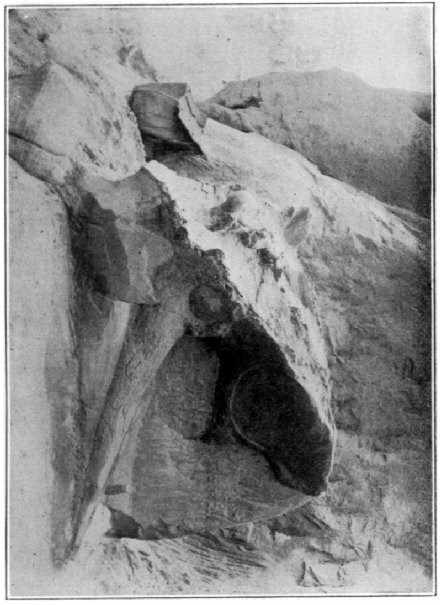 I believe it is the first specimen of a large American dinosaur to be mounted in Europe, though a cast of the great Diplodocus ca1'negie was sent to England, Germany and France, and the great specimen mounted by the late Mr. Hatcher, its discoverer, in Carnegie Museum, at Pittsburg. If we live, you will hear more of this barren region as we hope to enter that field as soon as the frost is out of the ground.